Spring bulbs can become congested over time leading to decreased flowering, increased pests and diseases and other problems until they finally disappear from your garden. But with a little care they can keep flowering and multiply around your garden. Grown from corms these can bulk up after a few years and flowering reduces. Lift and divide the corms about a month to six weeks after flowering has finished and spread them around your garden, replanting immediately into soil improved by garden compost . These can become congested over five or six years and need to be divided before flowers vanish. Lift carefully after flowering and avoid damaging the foliage. Ease the bulbs apart and replant individual bulbs immediately into soil improved by garden compost. Plant at a depth of approx. 18cm. I love seeing masses of these lovely blue flowers mixed with snowdrops but the common form of Grape Hyacinth can be very invasive and needs lifting and thinning out every few years. Lift the larger clumps as soon as the flowers start to fade and ease the plants apart. Replant the required number individually and move the remaining healthy plants to other parts of the garden or give them away. 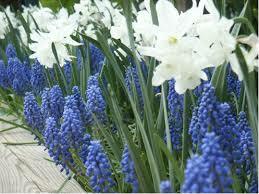 Muscari should be planted at a depth of approx. 10cm. These early bright yellow flowers cheer me up on early spring when very little else is open at ground level. If they do become congested then simply lift them whilst still in growth (in the green) , divide and replant immediately in new positions into soil improved by leaf mould or garden compost. .
One of my favourite spring flowers which looks amazing sweeping through woodland and in shady areas of the garden. 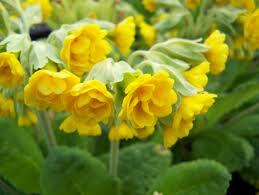 These form clumps very quickly and should be divided on a regular basis to encourage flowering. Lift ‘in the green’ as the flowers fade, divide into single bulbs and replant in damp shady areas of your garden into soil improved with leaf mould and at a depth of 10cm. If buying Snowdrops then always buy in the green for best results. Tulips seem to have a very short life span in most gardens in Yorkshire and they really need a very well drained soil to thr ive. Their life can be increased by lifting them after flowering. Wait until the flowers and leaves turn yellow and start to fade and then carefully dig them up. Brush off as much soil as possible and remove any bulbils which have formed around the bulb. These will drain the strength of the bulb. Allow to dry for a time in a dark cool place like a garden hut, brush off any remaining soil and then pack away until November when they can be replanted in the garden. You can carefully store them in cardboard boxes but I like using old tights hanging in a corner of my garden hut where air can circulate. These form large clumps very quickly and you can often create ten or more new plants from a single clump. Lift after flowering and gently ease the newly rooted outer pieces of the plant away from the woody centre. Discard the original plant and plant the new ones in humus rich soil in semi-shade and keep watering until established. Website Build by Secret Pie.